I ended up with Diablo through sneaky, downright underhanded means. I employed the lack-of-choice method. MUM: So what are we getting you for Christmas this year? SUZANNE: Oh. There's there game! It's called Diablo! It's a computer game and Sabrina's got it and I've played it and it's awesome! SUZANNE: You fight demons and stuff underneath a cathedral. MUM: ....Right. So what else do you want for Christmas? I'd spent pretty much the whole of the preceding year at my friend Sabrina's house (Sabrina has a website! She's still as cool as she was then!) , being a horrible computer hog, being completely obsessed with this game. I'll bet she regretted introducing this to me. I can't even specify what it was that drew me in. 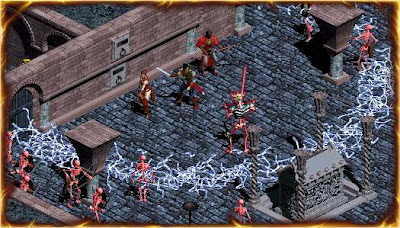 It had a fantasy setting, a faux-religious angels versus demons schematic, you could collect amazing looking gear and it was just scary enough to be thrilling. It was my first Blizzard game, and would most certainly not be my last. So Christmas came around, and I had been very carefully not thinking about what I might get. Because I was worried about how my parents would feel about the M rating on it - I was thirteen, and the first child in my family interested in computer games, so Mum had no previous experience with the gaming rating system, and it was a legitimate concern that it would be deemed too violent. And I knew I would be completely - completely - crushed if I didn't get it. Crushed. I'd never wanted anything more. So I avoided even looking at the tree, my eyes veering away as if repulsed by an opposing magnet when I went wandering past. 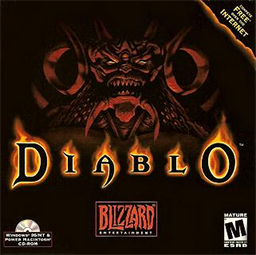 So Christmas indeed arrived, and I believe I actually screamed when I picked up a distinctively PC game shaped box and unwrapped it to review the glory and wonder of Diablo. I believe I almost had tears in my eyes went I went and hugged my parents. I'm neither a hugger nor a screamer. This was a colossal event for me. Goes without saying that I played this all day and far into the night, my first nights sleep being completely destroyed by constant images of demons and skeletons and succubi seared into my eyelids. I believe I lay fully awake for about four hours then scuttled back to the computer at about 5am. I was smitten. Totally gone. It also became something of a social network for Sabrina and I and a group of friends - Battlenet was a completely new beast for me, something unprecedented and unfamiliar, and very exciting. I can still converse in battlenet-speak when called upon (GPOW, anyone?) and remember this gaming period vividly and with serious nostalgia. Bless you, Diablo. You did good. Now for the love of god release Diablo 3.